Tom’s 1873 with Grape leaves and vine scroll is a stunning example of scrollwork design, yet is a very simple pattern that I think will make it much easier to grasp some of the principles of a well laid out scroll pattern and with his permission, I am going to use it as a basis for this tutorial. His design elements of the leaves, tendrils and grapes are balanced, his overall design of the backbones compliments the shape of the gun, the rhythm of the interior sections are in harmony with exterior areas and the overall design of the three panels compliment each other for the finished product. First lets look at the overall gun. What do you see? Three panels are there, with each one having an entirely different shape of it’s own. 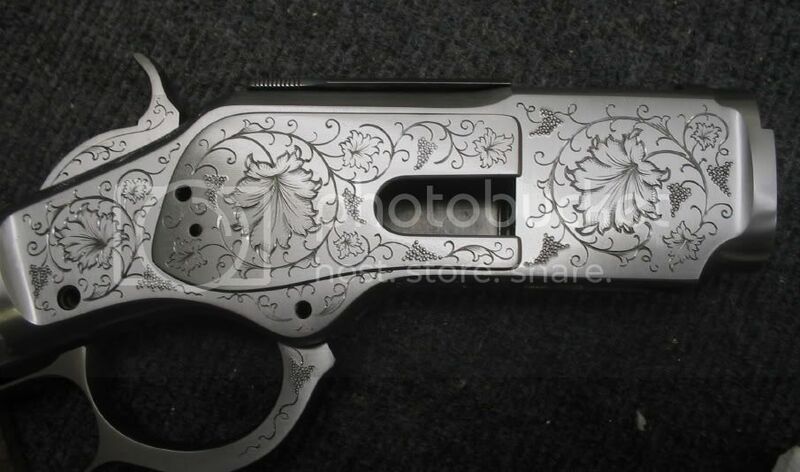 Each of these panels are study in and of themselves of scroll design, so lets break down this gun into the first panel that would just be behind the barrel. What do you see here? What is the most striking thing in this panel? I suppose technically there could be two things, but they are somewhat connected. Don’t be afraid to jump in here with your questions or comments. Down below the overall photo of the gun there is a box with an X in it like you tried to put in a cropped panel? Nice metal work on that gun, nice and crisp. This ought to be a good tutorial. well, its seems my learn2engrave.com website is down right now. It was up last night. Thanks Tim, I'll pass your words on to the polisher! hmmmm, 101 views so far, and no has hazarded a guess thus far, so I will ask the question in a different way, what is your eye drawn to first when you look at this panel. The big leaf in the middle and the direction of the growth of the vine. I remember when Tom posted it. I love the design and layout. This should be a great tutorial. Same here: The big grape leaf in the center. Yes, the large center leaf. I would say the most noticeable design feature of this gun is the 3 large leaves that take up the central portion of each panel. In the panel we are looking at first, you can see that the leaf is centered in the space dictated by the panel’s edges. If you erased everything but the leaf, you would see that it is sitting in the middle of the panel, balanced as it were, with an roughly equal space out to the north south east and west edges. It is somewhat abnormal in scrollwork to have a leaf itself this big in the overall pattern, so lets look at another aspect of the design, the main scroll in this panel, which as you can see fills the panel in a equal balanced manner. This is your main scroll, akin to the trunk of tree. When laying out a design, you want to draw your main scrolls so that they fill out the area in equal proportions, meaning that the scrolls should be roughly the same size. In this panel, there is only one main scroll, so notice that it fills the whole panel in an equal manner. Excuse my messy photoshop erasing, but can you see that each of the four quadrant sections created by this scroll spine are roughly equal in size to each other, Even #4 which is an odd shape because of the shape of the outline of the 1873. This again is principle we want to enforce, creating areas of roughly equal size as we ad details into the picture. Not only are the roughly equal in size, they are balanced in their placement, with each of the four smaller areas around the one big scroll equidistant from each other. In this case, you have created a square with each of the smaller areas (1-4) being a corner of the square. Ok, going back to the overall picture, what is the next level of design elements that jump out at you? I'll bite and say the flow of the scrolls which includes the point of origination. The side plate scroll originates from the larger screw hole and rolls forward then spawns the smaller scrolls. The scroll on the left or rear bolster also originates from a screw hole and rolls counter to the main scroll on the side plate. To maintain balance the scroll on the right or front bolster also rolls counter to the main sideplate scroll. Note: I'm not saying that scrolls must originate from screw holes but one must strongly consider the point of origination and in this case the screw holes work for Tom's design. To me what I notice is the overall balance and symmetry with a consistent amount of open space throughout. It is a non traditional style of scroll that I find pleasing to the eye. Also, looking at the whole gun my eye is not fixated on any one area. This really ties in to what you were explaining to me. I don't think that there is a wrong answer here, it may not be what the engraver intended but I see the grape clusters second to the big leaf. IMO that is what my eye is drawn to. I think that this will help me considerably. Question - which was drawn/engraved first the leaf or the scroll? I did not really say what I meant I don't think. In order of precedence, I see the big leaf, then the grape clusters. I won't get ahead but I have the 3rd in my head. well first i notice the balance, the proportioning to the area he was working on is very consistent. All the scrolls , leaves , grapes are proportionate to the area and he appears to have kept the same distance from the perimeters in all his areas , very nice . As to what draws my attention first , the large leaves . Yet at the same time the other smaller leaves, clusters of grapes and scrolls are just enough to want to draw your attention away from the main focus . which then wants to draw you back . To me the leaf on the raised panel is the first thing I notice then the other two larger leaves. If you apply the rule of thirds to this action you will notice that the leaf on the raised panel hits almost right on one of those one third division lines. That tends to give it a bit more emphasis than the other two. The next tier of emphasis is a bit more difficult for me to pin down. Once I get past the larger leaves the repetition and the arrangement tends to pull my eye through the other elements fairly evenly. I find my eye not really picking out a stronger element between the main scroll stems, the smaller leaves and the grape clusters. I do find that my eye tends to scan the design fairly well. Even though it does have three large areas of emphasis the overall design is strong enough that my eye does not get stuck on any one place. do any of you use the golden mean “ 3, 5 rule “to lay out your distance and proportions or is it all by eye ? first, thanks for this thread, very much! I saw the large leaf left of the loading port... and in the second picture (which I actually looked at first, the big picture didn't show up at first), the large leaf and then the grape clusters. What I notice other than the leaves and grapes is the smooth cutting, no bends, elbows, whatever. I often use the rule of thirds for placing focal points but I don't consciously use the golden mean for proportion. I generally eyeball that. well i would think , you sir , have a very close eyeball . i bet your so close on that work its scarry . Okay, a number of good things of been mentioned, but for now I want to keep this simple as possible for those who are beginners in scroll design. I for sure don’t want to get into the Golden Ratio right now. While it is certainly an underlying yardstick, I don’t think trigonometry is the reason people want to read this thread. Many fine engravers and artists have composed scroll designs for centuries in wood, stonework, tapestry, paintings and of course metal with little or no mathematical skills. I just cringe at the thought of someone trying to design scroll with a set of proportional dividers in one hand and a pencil in the other. In this thread, I want to give someone new to this art the skills to recognize shapes, patterns and flows within a scroll pattern with their own eyes and ultimately subconsciously or consciously design patterns with these principles of excellance. The old "eyeball thing" to some. So with that in mind, I want us to keep our focus on the first panel, shown here again. We will go back to the overall design on the 1873 later, but now lets stay on this small area and study the basics. When your read you begin with A, B, C, when you sing you begin with Do-Re-Mi (those who have had class with me know this the point I break forth into song) When you do scroll you begin with draw, balance and fill. To review up to this point, we have noticed the big center leaf and the big mainbody scroll that fills up the intial space creating 4 separate outer spaces. There is also of course the inner perimeter of space inside the backbone that is roughly equidistant to the large center leaf. I think the next thing in importance to be noticed in size and interest is the clusters of grapes. If you look at these, what shape do you see that they create? Do you see the Equilateral Triangle? What about the Isoceles triangle? Either of these present the grape leaves in balanced proportion to the rest of the pattern, irregardless of what else is in the pattern. Welllllll, I hear someone saying those two clusters at the right side of the pattern are two close to each other, considering the equidistance to the others involved. Yes that is true, but if you consider that they are also at the front of the gun, in essence they are foreshadowing or pointing down the barrel, creating an “implied line” that Ray was talking about in another thread. Okay, time for me to go to bed and you to work on your homework. What is the other set of design elements creating a geometric shape that is present in this panel alone? D.C., I can't speak for Tom, maybe he can chime in and tell us what he did, but honestly if I was doing this it could go either way, knowing that the other was coming. As I alluded to earlier, this is an atypical scroll pattern in that you have a large leaf in the center of the scroll, at what is normally the termination or end-point of the scroll. But for a normal scroll, you would draw your main body scrolls first, filling the area in a as balanced a manner as possible, so that leftover spaces were roughly equal in size and proportion. These leftover spaces you would start fill with smaller scrolls, what we would call your intermediate scrolls. In this case, I probably would roughed the the big leaf in the center, and then drawn the leaf bigger or smaller depending on how much space was present between the the leaf and the scroll spine. Honestly though, I don't think it would have made any difference to the end design which was drawn first. I got the leaf right first, then added the vine. Normally, I would draw the scroll tendrils first. I will wait before talking about how I got the leaf "right"
Thanks Scott, I am learning also! Anybody see any other shapes present in the front panel? circles, squares, triangles? Talking about the shape of the grape clusters overall positioning creates a large triangle with the main leaf creating a circle in the center and the vine/scroll creates another circle around the leaf, basically a triangle with 2"circles" inside of it. I'm sorry I missed the beginning of this post when you started it. I was away from the computer for a few days. This is a great post and thank you for your hard work doing this. When you can put something so people can relate to what is going on, it is much easier to understand. I understand triangles, squares and circles, it's how you find a place to put them in that hangs me up the most. This makes it a little easier to picture how to place them. Doing a lesson in writing isn’t easy, I found that out the hard way. It is hard not to over explain something so you don’t confuse everyone. And there is that one student that just doesn’t get it, no matter how you put it. Yes, I tried to plot out a scroll when I first started to learn to engrave. I figured there HAD to be a way, there is. You have done a great job here, thanks again. Tim C, what do you mean plot out a scroll? I have never heard that phrase. Can you post an example. I wonder if he means using CAD, or something like that? I have created scrolls in Corel draw. Not perfect, but once you have them, you can use them over and over, alter them, scale them, duplicate them, etc. It can help with keeping the main tendrils in proper relationships to each other. One thing using the computer has done for me, and did for me on this design, was that it helps one be "honest". When drawing completely by hand, one can be tempted to "fudge" a diffcult area, and make a scroll or leaf that is too big or too small to fit consistently in the rest of the design. using the computer to scale and place basic elements on the design can save a lot of hand sketching time, and , at least for me, forces me to find the basic size, scale and shape that the rest of the design can be based upon. I have an engineering background, I used an old CAD program, but the process took a lot longer then it took to learn to control the spacing and keep it even by hand. That was many years ago, I don't even have the program anymore. Now I have a Corel program that can make a scroll 1, 2 or 100 revolutions if need be with the click of a button. It is a good thing for layout, but it draws a scroll that is almost TOO perfect. It just doesn't look right, If I play with it I could do better with the program but this is art, so getting the scroll close is all I really need. When I cut layouts from COREL DRAW I don't follow then exactly. If you convert the spiral to curves, you can add nodes and get them to look good. Esp if you scan in a nice photo of a scroll, import it, and then use it as a guide for shaping the digital scroll you are creating. Okay folks we were looking for other patterns that are formed by other significant features in this engraving. We found an nice big scroll that was equally balanced in the shape. We found a big leaf equally balanced in the center area of the shape. Next we looked at the grape clusters and found that they made a triangle equally balanced in the shape. The next most significant feature I see is the leaves that are part of the spine of the scroll, actally point outwards rather than inward like normal scroll leaves. In a natural sense, these could be the newly budded leaves that haven't quite yet taken their final shape as they grow out. What do we have we look at them alone? Are there any other patterns present in this section? Now actually there is another pattern to see and actually it is a triangle to, but the fact that we have three triangles is not the point I want you to leave with is that the points that make up these triangle, whether it is leaves, or grape clusters, or gold inlays or medium size scrolls is that they are spread in an equal balanced manner through out the pattern. In any one of these pics that I have erased the other components you can see that what is there is sitting with an equal amount of negative space around the items that are shown. This is a major principle of scroll design that you must understand. The oppsite of that, placing the items in an unbalanced pattern is going to look odd, take a look at this with some extra clone stamped grape clusters. Now all of sudden your eye is drawn to the bunches of clusters on the left side, and you are kindof stuck there, left wondering...why? whearas a nicely balanced pattern lets you take in all the features as your eye can travel freely around the pattern. There are always exceptions, or reasons that we do something different, and there are times when we may want to make some a little unbalanced for a reason. Take a look at this picture, what do you see? Is it unbalanced? I would like to hear from some of you on why you think the leaves are in the position that they are in. What I see is that the leaves form another triangle with the two larger leaves facing downward indicating mature growth, and the smallest, which is highest in the panel, facing upward indication growth. I am going to stick my neck out and show my lack of knowledge. I do see that the leaves form a triangle of sorts. I think that they seem to come from a central point sort of. What stands out to me is that the way they are drawn and engraved adds depth to the engraving. The one on the top right looks like it is farther away, bottom right closer, big leaf closest. I think I learned somewhere that in drawings that is how you give the appearance of depth. I don't think I would have seen it this way in the engraving without you removing the other items. great! we are getting some good replies here. Anybody else see anything ? Thanks for offering this tutorial. I appreciate how you are leading us to the answers to these questions without just telling us outright. It really makes you think about what makes a good design. I have an amibitious knife project in the design stage right now and this thread has been a real blessing. Okay we had some good thoughts about the leaves, with some things I hadn’t considered. What I was looking for was someone to talk about the unbalanced nature of this, and how it could be corrected. You have the one big leaf in middle, so it is centered. The two smaller leaves at the front, do make it a bit unbalanced. If we wanted this panel to better balanced , then it would have been better if the leave layout was something like this. Here a small leaf is in each corner in very balanced, well proportioned way. But why is this not the way Tom did it then? Did Tom make a mistake? Should it have had these 4 small leaves this way? If this was a stand alone panel with nothing else involved then most likely the answer would be yes. But this section does not exist all by itself, it is one of a total of three separate areas that make up the entire side of the gun, so now we have to go back and look at balance across the whole piece. But first I wanted you to see the various parts of the pattern broken down into their components so that you could see how the were laid out in equal fashion. I hope you getting something out of this, if not don't be afraid to ask some qeustions. What are the major design components overall all 3 seperate panels? I would say the major components are the scroll backbone, the large leaves, the small leaves and bunches of grapes. In Ron Smith's Advanced Drawing of Scrolls book, he writes about adding extra 'force lines' which I generally take to mean more than one scroll backbone originating from the scroll body or base. In Tom's design, would you consider short backbone element leading to the large grape leaves (off the main scroll backbone to be a extra force line or am I off in left field? The large leaf in each pattern does draw your eye to the center, but the corresponding elements all seem to "point" to the central growth point of the vine. They all seem to mimic the natural growth of the vine and its fruit. Jerry, see if you can get some "Sawgrass Bass" to bring, aka 'gator meat! I'll buy what we don't eat.